The Earth is beaming with life and yet there is no consensus on how life arose or what life is. The origin of life is “one of the great unsolved mysteries of science” (Crick, F. Life Itself). While there is no accepted definition of life, most of us [humans] can easily discriminate the living from the non-living (IrisFry’s Book is a good primer on ideas regarding the origins of life). Questions about the origin of life became more prevalent after Pasteur and others showed that life did not arise spontaneously. The discovery that the raw components of life are present throughout the universe suggests that life could exist elsewhere, and that the origin of life as we know it may have depended on materials that arrived on Earth via inter-stellar travel. Some scientists have speculated that life itself originated elsewhere and made its way to earth. In 2012 a movie called Prometheus was released. In this stunning movie human scholars find similarities between archeological sites from ancient civilizations separated by centuries have drawn the same pictogram. The archeologists conclude that the pictogram must be a map, an invitation, from the “engineers” who not only designed us but have intervened in our affairs. The movie is set in 2093 and researchers decide to go and find them in a quest to further understand the origins of mankind. Despite its several and severe scientific flaws, Prometheus is an interesting film because it addresses that ever mysterious quest to unveil not only how we came to be but how life began. Life in space has been making the news, and on November 20th 2012, NPR reported that NASA’s Mars Curiosity rover had gathered important data. Mars holds a special place in our world. The principal Mars’ rover investigator, John Grotzinger claimed "This data is gonna be one for the history books. It's looking really good,". He refused to give any more details because his team had to confirm their findings. In general, this is good practice because scientists want to avoid finding superfluous results and correlations; however, in this case, it heightened suspicion. Shortly thereafter NASA tried to downplay Grotzinger’s statements, pointing out that it was the mission which was historic rather than a specific finding. Despite this backtracking some speculated that organic compounds had been found, some claimed that it was life that had been discovered. 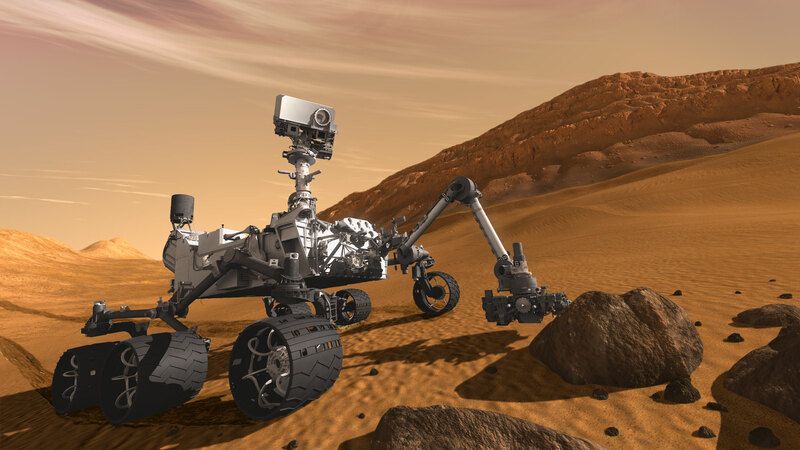 On December 3rd NASA confirmed, Curiosity had found Organic compounds but it was uncertain whether they were indigenous to Mars (or had been brought by Curiosity). Most of the speculation had suggested that organic compounds were the “historical finding”. These are also important because they confirm that the stuff of life, the raw materials, are far more common than originally thought (as corroborated by the discovery of signs of water and organic molecules in mercury), or the finding of organic molecules in meteorites. Like the discovery of extremophiles which showed that once life got started it could be found in unexpected places; the advances in the search for extraterrestrial life suggest that the stuff of life, and hence life, could be commonly found throughout the universe. Francis Crick (who co-discovered the structure of DNA with James Watson) and Leslie Orgel once proposed that life on Earth was the result of a deliberate infection, designed by aliens who had purposely fled mother nature’s seed to a new home in the sun. Crick repeatedly addressed the question of the origin of life between 1971 and 1988 (I am currently working on a historical study of Crick and Orgel’s theory of Directed Panspermia and its reception). Crick and Orgel proposed their Directed Panspermia theory at a conference on Communication with Extraterrestrial Intelligence, organized by Carl Sagan and held at the Byuraka Observatory in Soviet Armenia in 1971. This theory which they described as an “highly unorthodox proposal” and “bold speculation” was presented as a plausible scientific hypothesis. Two years after the conference they published an article in Icarus on 1973. Crick and Orgel were careful to point out that Directed Panspermia was not a certainty; but rather a plausible alternative that ought to be taken seriously. In the paper Crick and Orgel recognised that they “do not have any strong arguments of this kind, but there are two weak facts that could be relevant”. The 1973 paper focuses on the universality of the genetic code and the role that molybdenum plays in living organisms (I am likewise working on a history of molybdenum and the origins of life) which is more than one would expected given the abundance of molybdenum on the earth’s crust. Crick and Orgel used the universality of the genetic code to support the theory of directed panspermia because if life had originated multiple times or evolved from a simpler genetic code one could expect living things to use a slew of genetic codes. Further, if there was only one code, Crick and Orgel reasoned that as organisms evolved they should evolve to use the same codons to code for different amino acids. We can draw a parallel to language: while many human populations use the same symbols (letters), they combine them in different ways. These different languages use the same alphabets but different combinations of the same symbols to denote different objects (French, Italian, Spanish, Portuguese, Catalan) as opposed to different codes (languages which uses different alphabets like Spanish and Mandarin); however, what we find is analog to a single universal language. Their most convincing argument was the importance of molybdenum in organic processes and its relative scarcity on Earth. They had argued that living organisms should bear the stamp of the environment in which they originated. Organisms, Crick and Orgel held, would be unlikely to develop a dependency on elements that were extremely rare as organisms that relied on elements which were more abundant would be favored by selection. An organisms that was able to substitute the rare element for one which has similar biochemical properties but is more frequent would have a clear advantage. Crick and Orgel pointed out the “anomalous abundance of molybdenum” in organisms made it possible that life arose in an environment rich in molybdenum. The abundance of molybdenum in living organisms suggested that life started in a molybdenum rich environment and they found that the Earth is not sufficiently rich in molybdenum (this was later challenged as the amount of molybdenum found in the ocean is higher than in the Earth’s crust). Thus, they suggest that this difficulty could be resolved if life began in a molybdenum rich environment. Likewise, the fact that all organisms use the same codons for the same amino acids could be explained if life had arisen elsewhere and the organisms which were used to infect lifeless planets shared a language. Crick and Orgel also suggest that the universe is sufficiently old that other intelligent civilizations could had arisen elsewhere. One of these other intelligent civilizations could have built a spaceship and seeded the universe with life. One can easily imagine a not too distant future where humans accept that our planet and all that lives within it will perish. In the unlikelihood that this is the only planet that harbors life in the universe its demise would leave a lifeless universe. The demise of our kind is hard enough to accept but the prospect of a lifeless universe, a universe that could never come to know itself, a universe so grand and yet with no one to admire it or even dwell in it could be too much to bear. In order to save our kind we can envision our zealous and hard working descendants endeavoring to colonize other worlds (by sending microbes through interstellar journeys). Microorganisms are easier to transport and could more readily adapt to new conditions; sending larger organisms would be too difficult (Crick and Orgel pointed out). The origins of life remains an unresolved mystery. I argue that Crick and Orgel’s paper was meant both as a serious and plausible scientific alternative and as a means to criticize concurrent origins of life. Considering the life arose elsewhere could also free scientists studying the origin of life from trying to imitate the alleged conditions of a pre-biotic Earth. My ongoing research suggests that while Orgel abandoned Directed Panspermia, Crick continued to advocate for its viability and to argue in its favor. Our continued exploration of space will, presumably, continue to reveal the existence of organic compounds in space (and quite possibly life) and hence suggest that the universe may be beaming with life. Images: Mars Curiousity by NASA; Molybdenum by Alchemist-hp at Wikimedia Commons; Francis Crick and Leslie E Orgel from FASEB journal. Christian Orlic is currently a graduate student in Zoology and he is study experimental evolution at Michigan State. Christian has a BSc in Zoology and one in the History of Science. Christian is currently working on an extended history of Crick and Orgel's theory of Directed Panspermia and its reception by the scientific community. (I do not quite know what to do for an author bio).